Hello Design Cutters! Renee here with a new tutorial for a fresh, skin care ad. 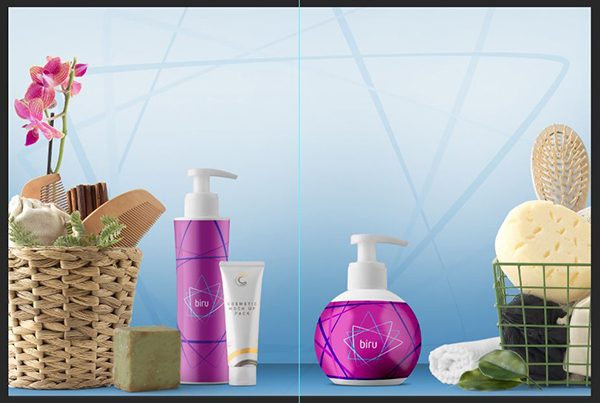 We’ll create our layout and products in Photoshop using packaging and elements from the current mock-ups bundle, plus we’ll pop into Illustrator to create a clean, modern logo for our products. HAVE YOU SEEN OUR NEW YOUTUBE CHANNEL? Watch the video tutorial below and subscribe to our new YouTube channel for regular updates direct to your inbox. 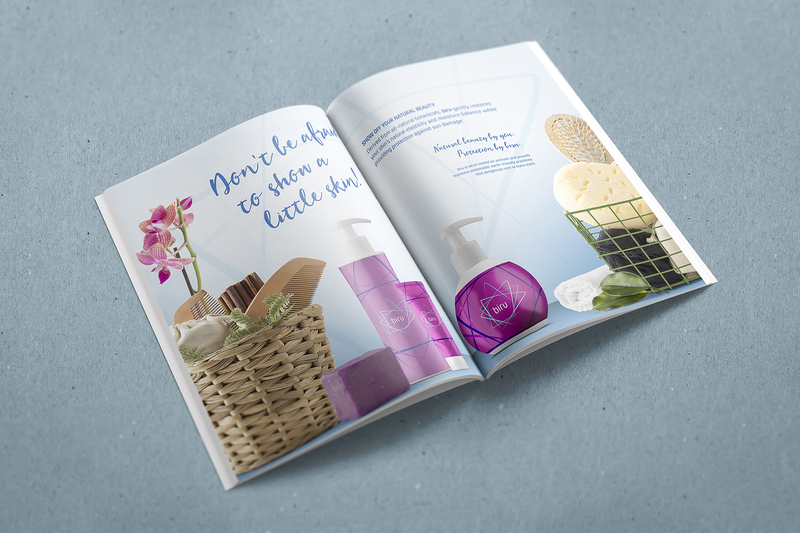 The freebie pack includes cosmetic packaging and front-view bath elements from the talented designers at Mockup Zone. This freebie pack is just a tiny sample of the amazing resources available in The Gigantic Mockup Templates Bundle for just $29 (that’s 99% off). 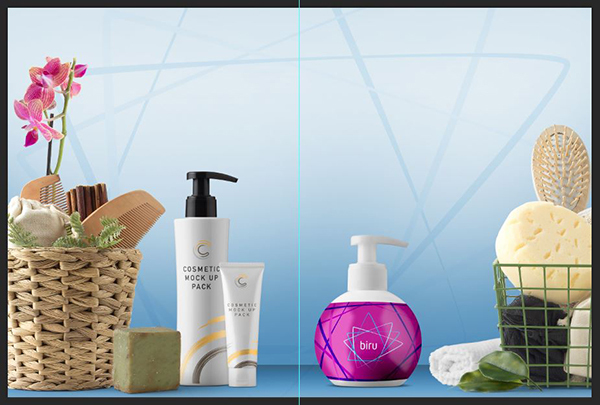 This huge collection of high-quality mockups includes everything from clothing and stationery to scene setters and packaging. Your designs will be even more memorable when presented in beautifully-crafted, realistic settings. We’re going to create an ad that fits a full magazine spread. Our folded magazine is 9” wide x 12” high, so we’ll need to double our width for the spread. Open Photoshop and go to File > New. In the New Document dialog box, enter a width of 18 inches and a height of 12 inches. 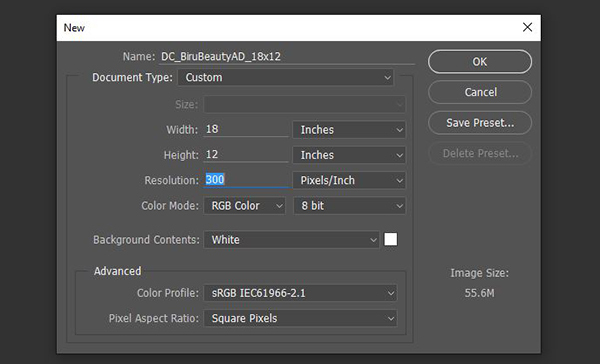 Set your Resolution to 300 ppi and your Color Mode to RGB. Note: For most magazines, you’d have to convert your ad to CMYK before submitting it to the publication, but your photo colors will stay more accurate and vibrant if you do your initial work in RGB. Click OK to create the document. Let’s start by adding a guide so we know where the middle of our spread, the crease, will be located. We want to make sure we don’t place any vital information across the split. Go to View > New Guide. In the dialog box, choose Vertical and enter 9 in, then press OK.
Now let’s pop into Illustrator and make our logo. We’ll use some elements from it on our background. Open Illustrator. Go to File > New. We’re only going to use this document to hold our logo that we’ll paste into Photoshop later, so the size doesn’t really matter. I’m going to make mine letter size (8.5” x 11”) with no bleed. Select your Rectangle tool (m). 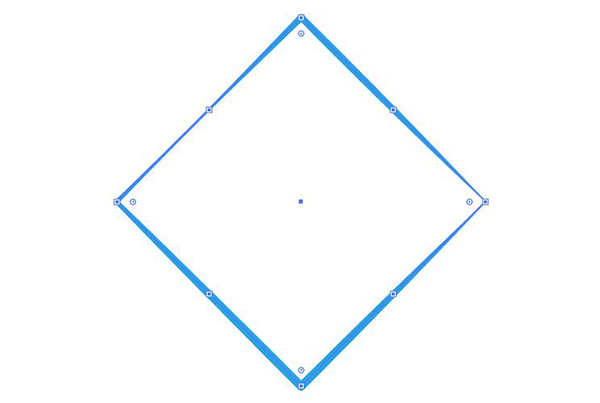 Hold shift (to maintain aspect ratio) and draw a square. The size doesn’t really matter, but to make it easier to follow along, go ahead and make it about 2.25” square. Open your Swatches palette (Window > Swatches) and set your Fill color to None and your Stroke color to CMYK 70/15/0/0 (which should already be a default color in your palette). Next, open your Stroke palette (Window > Stroke). Increase the Weight to 5 pt. Next to Corner, choose the middle icon for Rounded Join. Under Profile, choose Width Profile 2. Now we’ll turn our square into a triangle. With your Selection tool (v), hover over one of the corners until you see the double-ended, curved rotation arrow. Hold shift, then click and hold while dragging to the right. Release when your square has rotated 45 degrees. Select your Pen tool (p). Hover over the bottom middle point of the diamond until you see the pen icon with the minus sign. Click once on the point to remove it. Choose your Direct Selection tool (a) and click once on the top middle point of the triangle to select it. Hold down Shift and press the up arrow key on your keyboard about 15 times. We just want to make a nice, tall triangle. Let’s curve our edges out a little. 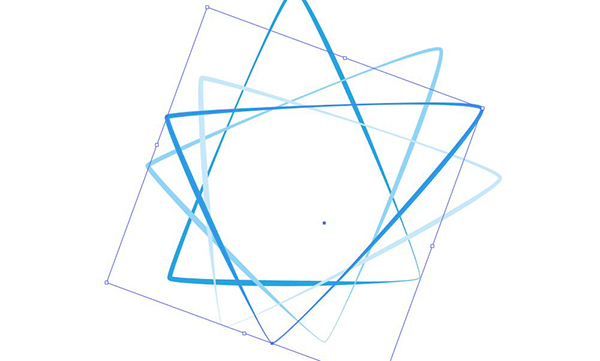 I don’t want it to be perfectly symmetrical, so let’s manually manipulate each point. Select your Pen tool (p). Hold opt, then click on the top middle point and drag to the left. Now we’ll repeat for the other two points. 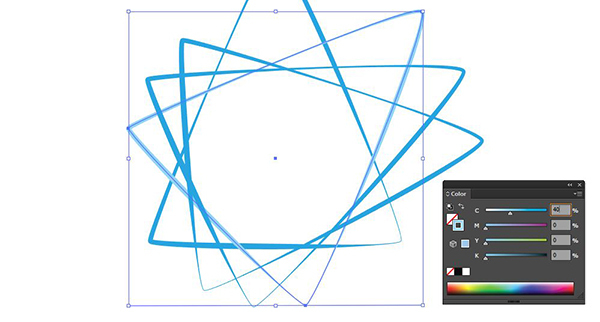 With the Pen tool, hold opt, then click on the bottom right point and drag to the top right to create a curve. Repeat on the bottom left point. Use your Selection tool (v) to select the triangle. Press cmd + c to Copy, then cmd + f to Paste in Place. Hover over the edge until you see the Rotation icon, then click and drag down to rotate -90 degrees. Press cmd + f again. Hover to see the Rotation icon, then click and drag down to rotate -110 degrees. Then press cmd + f one last time and this time rotate -130 degrees. Select your second triangle with your Selection tool (v). Open your Color palette (Window > Color) and change the CMYK build of the Stroke color to 40/0/0/0. 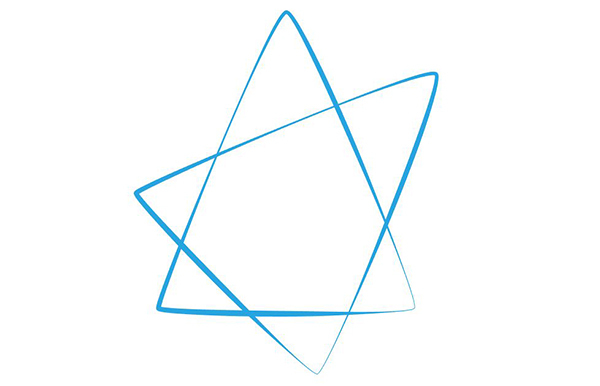 Select the last triangle we made and change the CMYK build of the Stroke color to 20/0/0/0. 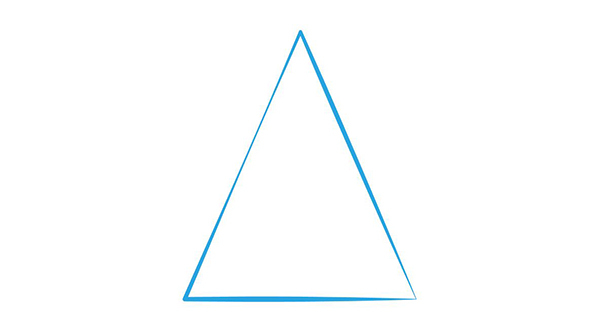 Select the second triangle, that’s still our original blue color, and go to Object > Arrange > Bring to Front so it sits on top of the other triangles. Now select the Type tool (t) and click once in the middle of the triangles. 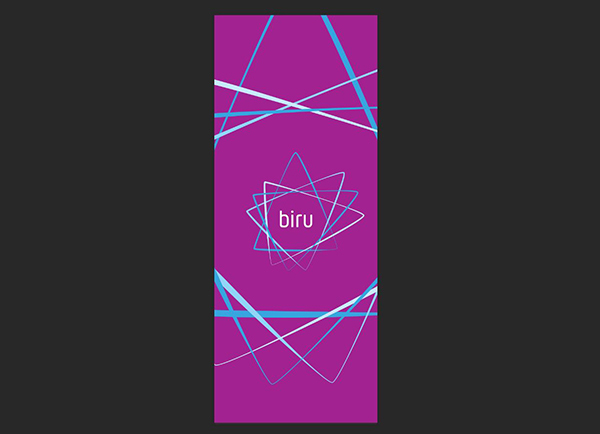 Type: biru. Open your Character palette (Window > Type > Character). Change the font to a simple sans serif font like Hansom FY Regular at 68 pt. Lastly, open the Swatches palette and change the Fill color to White. Don’t forget to save your file. Use your Selection tool (v) to drag across the four triangles, making sure not to select your text. Press cmd + c to Copy. Go back to your Photoshop file. Press cmd + v to Paste. In the Paste dialog box, choose Smart Object and press OK. Hold down shift and use the corner handles to enlarge the shape until it’s about 18” square – the same width as the artboard. In the Layers palette (Window > Layers), double click the vector smart object layer name and change the name to Background Triangles. Go to Layer > New Fill Layer > Solid Color. In the first popup, name your layer Blue Background, then click OK. 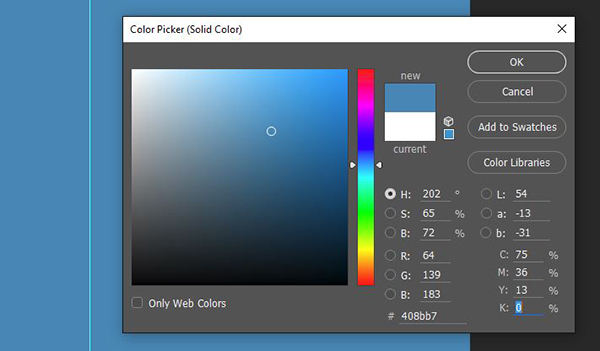 In the Color Picker popup, enter CMYK values of 75/36/13/0. In the Layers palette, click on the white box on the Blue Background layer. Now select your Brush tool (b). At the top left of the artboard, click the thumbnail of the current brush and in the drop-down menu, choose the Soft Round brush – usually the first brush. To the right of the current brush thumbnail, reduce the Opacity to 30%. Lastly, we’ll increase the Brush size. To do this, simply press the right bracket (]) key on your keyboard several times until your Brush size is 3000. Change your foreground color to Black by pressing d.
Brush across the top of the artboard several times. We’re masking out the blue, so the top of the layout will start to turn white. We want a gradient effect, but not as regular as we’d get using the Gradient tool. This way, we can easily add whiter or bluer spots behind our objects later. 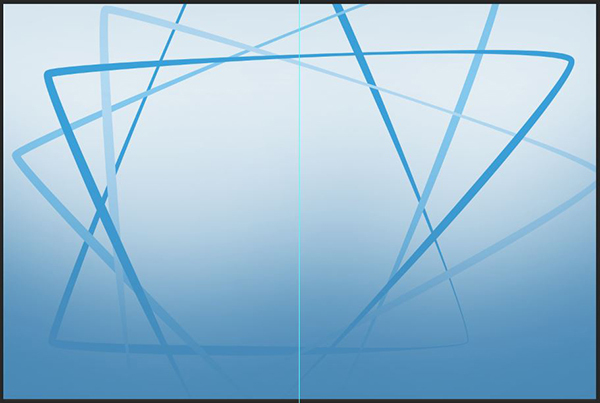 In the Layers palette, select the Background Triangles layer and drag it above the Blue Background layer. At the top of the Layers palette, change the Blend Mode to Multiply and the Opacity to 10%. Now we’ll create a surface for our products and elements to sit on. 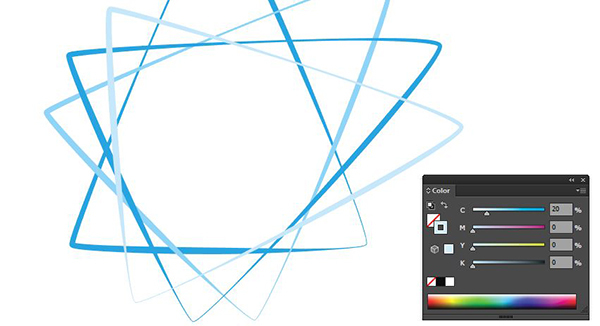 Create a new layer in the Layers palette and name it Surface. Make sure it’s the top layer. Select your Rectangular Marquee tool (m). Click below the bottom left of the artboard and drag up about 1 inch and all the way to the right of the artboard. Make sure your foreground color is black and background white by pressing d. Now select your Gradient tool (g). Hold shift and draw from the top of the selection area to the bottom of it. Press cmd + d to Deselect. At the top of the Layers palette, change the Blend Mode to Luminosity and the Opacity to 30%. In the Layers palette, with the Surface layer still selected, hold Shift and select the Blue Background layer. This should create a selection of all three layers we’ve made. At the bottom of the Layers palette, click the folder icon to Create a New Group. Double click the Group name and rename it Background. 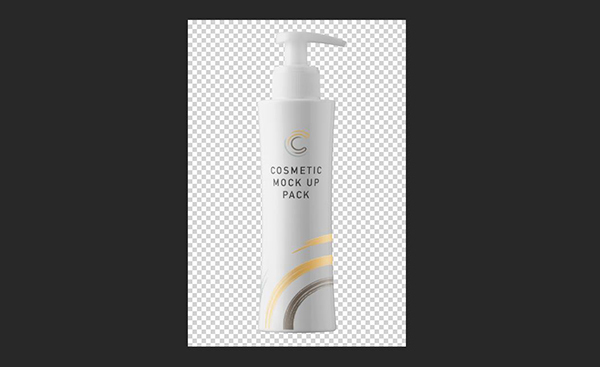 Open the MockUpZone_Cosmetics_Elements file in the Freebies folder. 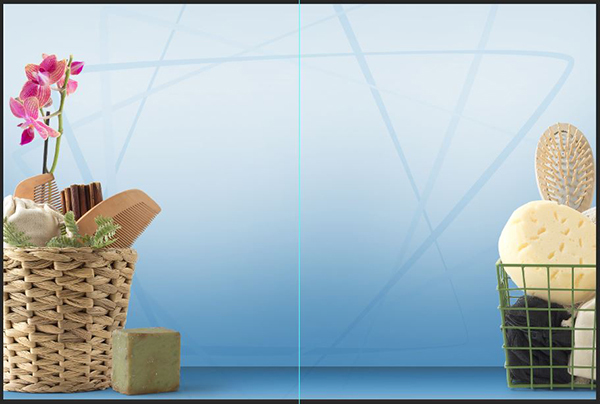 In the Layers palette, select the Wicker Basket Comp layer at the very bottom, then hold Shift and select the top layer, Wood Box Comp. With all of the layers selected, go to Layer > Duplicate Layers. 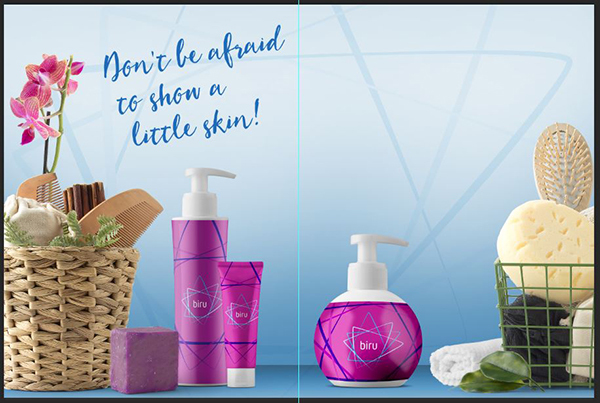 In the pop-up, select the main layout file (in my case, DC_BiruBeautyAD_18x12.psd) and press OK.
Close the MockUpZone_Cosmetics_Elements file. Back in your main layout, you’ll see all of the groups we’ve just copied. 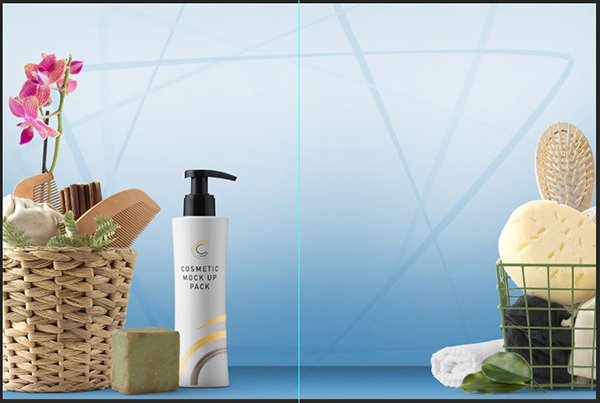 Now we’ll just arrange the elements and leave a couple of spots for our products. In the Layers palette, select the Orchid group and drag the group down until it’s just above the Background group. Position the orchid on the far left of the artboard, towards the top of the surface. Note: I’ve turned off the visibility of the other groups to better show the position of each element. To turn off/on visibility, click the eye icon to the left of the layer name in the Layers palette. Next, drag the Wicker Basket Comp group to just above the Orchid group. On the artboard, position the basket in front of the orchid on the far left, but lower on the surface (closer to the bottom of the artboard). Next up is the Green Square Soap layer. 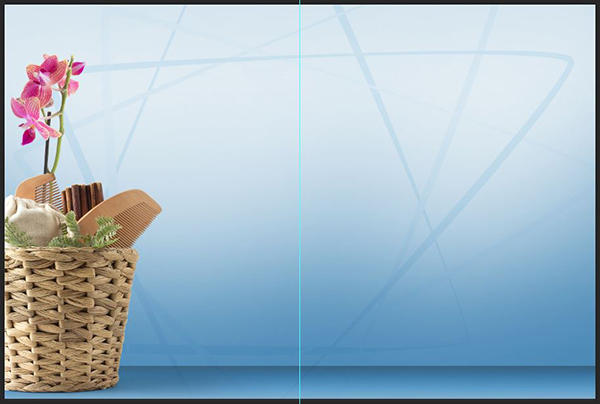 Move the group just above the Wicker Basket Comp group and position on the artboard so that it overlaps a little with the right side of the basket. Now we’ll add some elements to the right side. Position the Seddle Comp group on the far right of the artboard so you only see the sponge and loofah. We need something a little taller here, so drag the Wood Box Comp group BELOW the Seddle Comp group in the Layers palette. 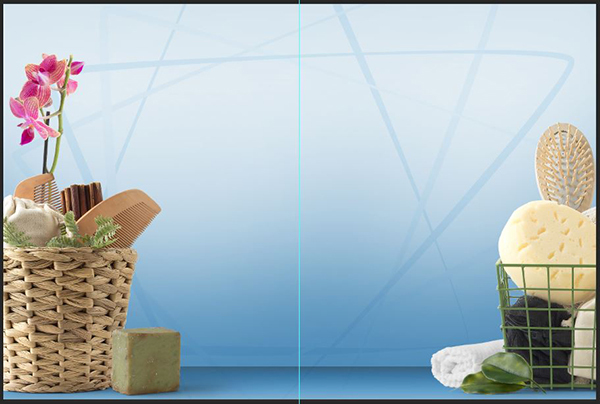 On the artboard, position it behind the sponge so only the brush is visible. Drag the Towel group below the Seddle Comp group. On the artboard, position the towel so it’s peeking out from behind the left side of the wire basket. For a last little touch, we’ll have the Leaves group at the top of the Layers palette. Position them where the towel meets the wire basket. 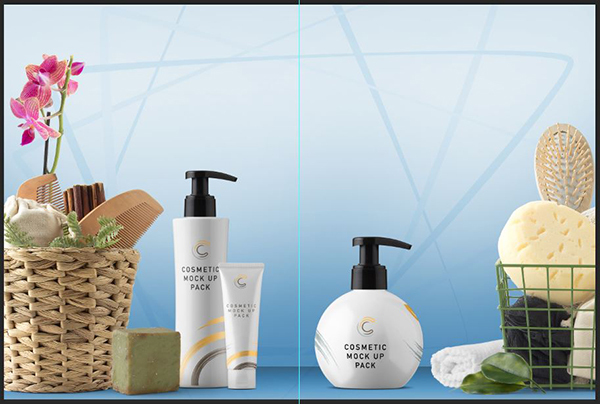 In the Freebies folder, open the file named MockUpZone_Cosmetics_Packaging. 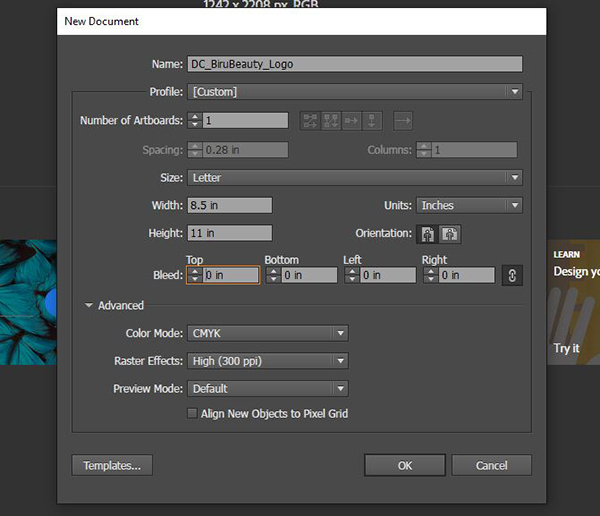 Just as with the elements, select all three groups and go to Layer > Duplicate Layers. Select the main layout file and press OK.
Close the packaging file. Back in the main layout file, drag the three new groups below the elements, between the Orchid and Background groups. Position the Curved Dispenser Bottle just behind the bar of soap. With the Curved Dispenser Bottle group selected, go to Edit > Transform > Scale. At the top of the artboard, enter a Width of 90% and click the link icon to the right of the width to constrain proportions. Then press Enter to complete the transformation. Position the Glossy Cream Tube just in front of the Curved Dispenser Bottle. Then go to Edit > Transform > Scale and this time, we’ll enter a width of 50% and click the link to constrain proportions. Position the Sphere Bottle on the right side of the layout. 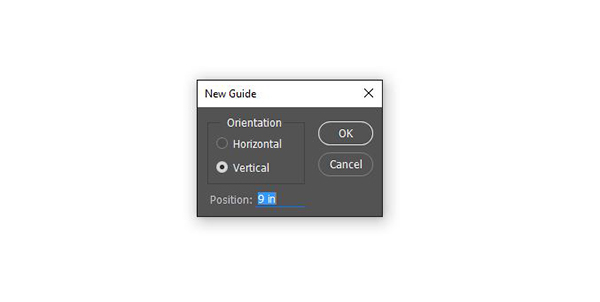 Go to Edit > Transform > Scale and at the top of the artboard, enter a width of 90%, then click the link icon to constrain proportions. Now we’ll create our product labels! In the Layers palette, open the group named Sphere Bottle by clicking the little arrow to the left of the layer name. Double click the thumbnail of the layer that says << double click to edit. This will open the bottle in its own window. 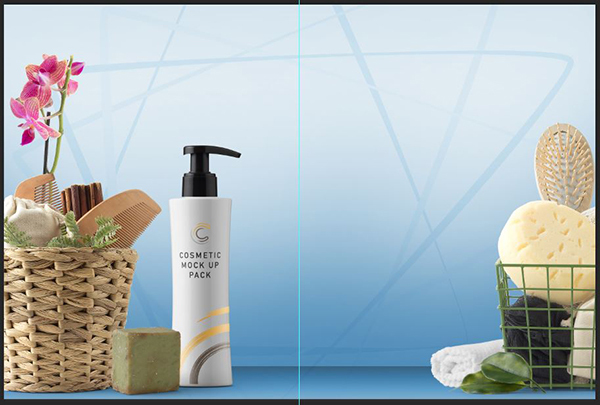 In the freebies folder, open the file named MockUpZone_Cosmetics_Caps. In the Layers palette of the caps file, select the cap 33 group, then go to Layer > Duplicate Layer. In the popup, select cap 38.psb (the bottle window) and click OK.
Now go back to the bottle window. You’ll see the white cap now in the file. Select the cap 33 group and use your Selection tool or arrow keys to position it directly over the black cap. With the white cap in position, you can turn off visibility to the black cap by clicking the eye icon to the left of the cap 38 group. In the Layers palette, find the layer named Replace Your Design. Double click on the thumbnail for that layer. Note: Don’t worry about resolving any font issues in the new window that pops up. We’ll be deleting everything and replacing it with our own art. In the new window that opens, delete all of the visible layers and turn on the visibility to the color fill layer. 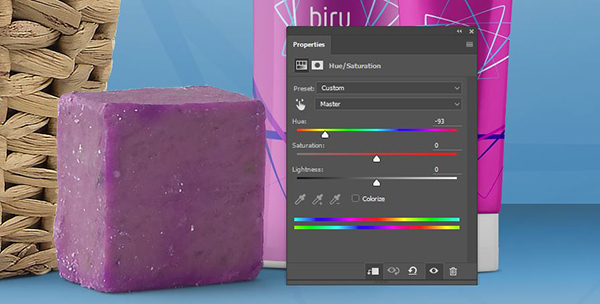 Open your Adjustments palette (Window > Adjustments) and click on the icon for Hue/Saturation. In the Properties palette that opens, click the Colorize box at the bottom, then enter a Hue of 308, Saturation of 60 and Lightness of -60. This is going to give us a crazy bright magenta color. Go back to your logo file in Illustrator. 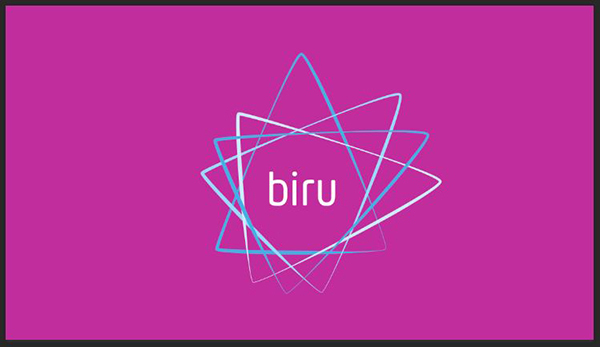 Select the entire logo and copy it by pressing cmd + c. Back in Photoshop, press cmd + v to paste it onto the bright magenta background. Select Smart Object in the popup, then click OK. Hold Shift and use the corner handles to reduce the size of the logo to about 3” square. 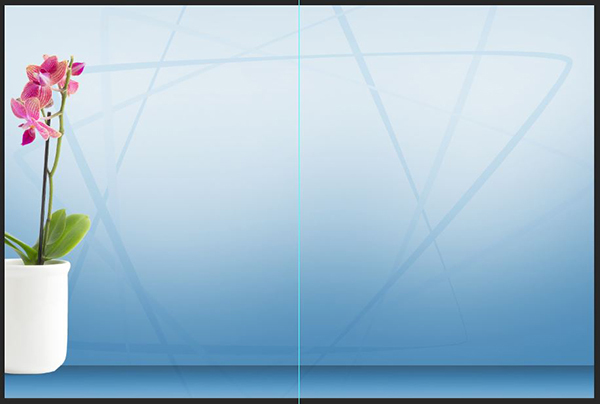 Position in the very middle of the artboard. 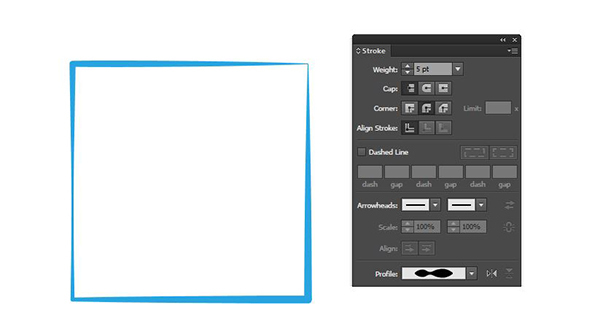 Go back to Illustrator, but this time just select the shapes without the text. Press cmd + c to Copy, then return to Photoshop and press cmd + v to Paste. Select Smart Object in the popup and press OK. Hold Shift and use the corner handles to increase the size of the shape until its much larger than the artboard – about 8” square. Position so the empty space in the middle is centered around the full logo we pasted in first. At the top of the Layers palette, change the Blend Mode to Color Burn. Press cmd + s to Save the file, then cmd + w to close it. Now you’ll see that the bottle has automagically updated in the bottle window, cap 38.psb. Press cmd + s again to Save, then cmd + w to close the bottle window. 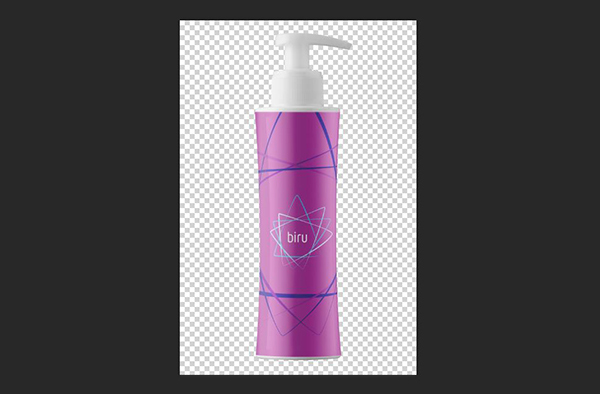 Now you’ll see that the bottle has updated in your main layout file! We’re going to repeat this same basic process for the other two bottles. In the Layers palette, open the group named Curved Dispenser Bottle by clicking the little arrow to the left of the layer name. Double click the thumbnail of the layer that says << double click to edit. This will open the bottle in its own window. Go back to the file named MockUpZone_Cosmetics_Caps. In the Layers palette of the caps file, select the cap 33 group, then go to Layer > Duplicate Layer. In the popup, select cap 382.psb (the curved bottle window) and click OK. Turn off visibility to the black cap group, cap 38. In your Adjustments palette and click on the icon for Hue/Saturation. In the Properties palette that opens, click the Colorize box at the bottom, then enter a Hue of 308, Saturation of 60 and Lightness of -60. Go into the logo file in Illustrator. 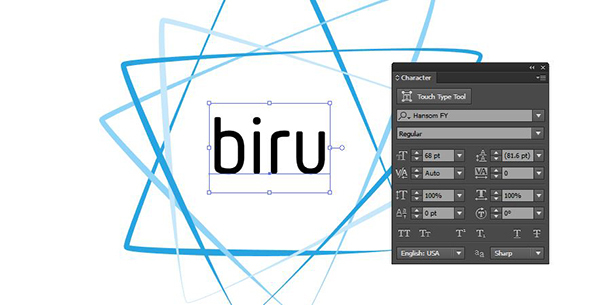 Select the entire logo and copy by pressing cmd + c. In Photoshop, press cmd + v to Paste. Choose Smart Object, then press OK. Hold Shift and use the corner handles to increase the size of the logo until it’s about 10 inches wide. Press enter to complete the transformation, then position in the center of the artboard. 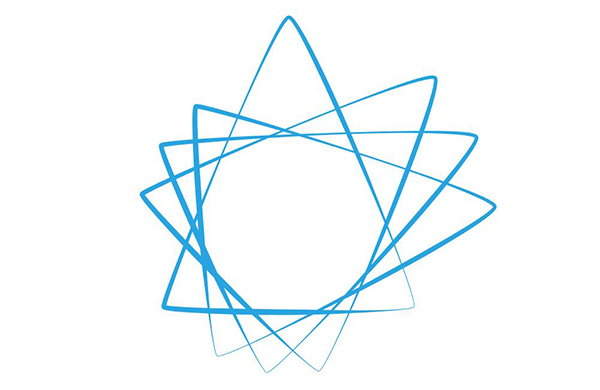 Go back to Illustrator and select only the shapes without the text. Press cmd + c to Copy, then return to Photoshop and press cmd + v to Paste. Select Smart Object in the popup and press OK. Hold Shift and use the corner handles to increase the size of the shape until it’s about 35” square. Position so the empty space in the middle is centered around the full logo. In the Layers palette, change the Blend Mode to Color Burn. Then press cmd + s to Save and cmd + w to Close. Now you’ll see your updated label in the bottle window. Press cmd + s again to save the bottle window file, then cmd + w to close it. Now your main layout file will be updated. Our last product label is for the small tube. Open the group named Glossy Cream Tube and double click the << double click to edit layer. This one already has a white cap, so we’ll just update the label. In the Layers palette of the small tube window, double click the thumbnail for the layer named Replace Your Design. Just as before, delete all of the visible layers and turn on visibility to the Color Fill layer. In the Adjustments palette, click the Hue/Saturation icon. In the Hue/Saturation properties, turn on Colorize, then enter Hue of 308, Saturation of 60 and Lightness of -60. 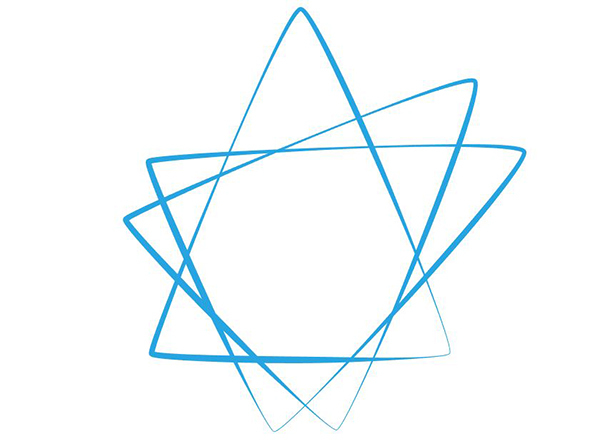 Copy the full logo from Illustrator (cmd + c), then paste it into Photoshop (cmd + v) as a Smart Object. Hold Shift and use the corner handles to reduce the size to about 2.75 inches square. Press enter when done. 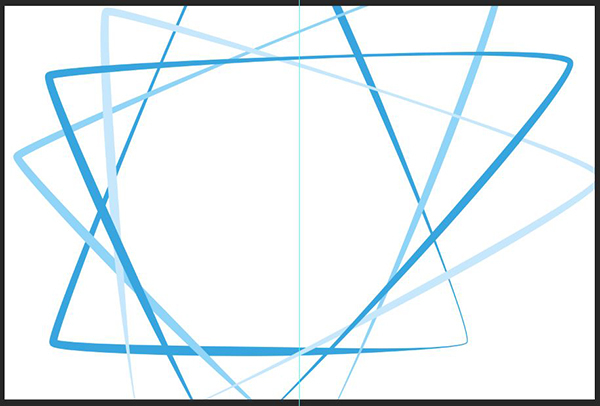 Go back to Illustrator and copy just the shapes without text. Paste into Photoshop as a Smart Object. Hold Shift and use the corner handles to increase the size to about 9 inches square, then press enter. Lastly, change the Blend Mode to Color Burn in the Layers palette. Press cmd + s to Save, then cmd + w to Close the file. Back in the small tube window, press cmd + s again to Save that file, then cmd + w to Close it. Now you should see the updated tube in the main layout. 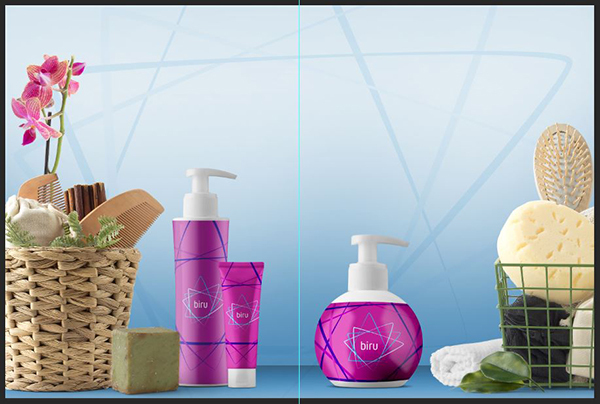 For one final little touch, let’s change the color of the green soap to match the purple/magenta color of our product labels. Open the group named Green Square Soap. Click on the top layer in the Group. In the Adjustments panel, select the Hue/Saturation icon. At the bottom of the Properties palette that opens, click the far left icon to clip the adjustment to only the layer directly below it. Enter a Hue of -93. Our last step will be to add text to our ad. 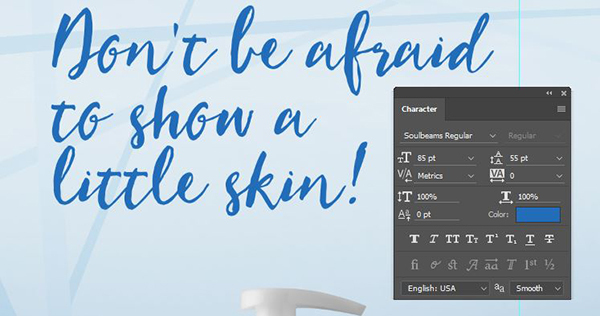 Open your Character palette (Window > Character) and use a fun, handwritten font like Soulbeams Regular at 85 pt. Click on the color swatch on the Character palette and change the CMYK build to 88/52/0/0. To add to the handwritten effect, we’re going to manually add a few spaces and set everything at an angle. With your Type tool, click in front of “to” and add one space. Then click in front of “little” and add two spaces. Next, go to Edit > Transform > Rotate. At the very top of the artboard, enter -10 degrees next to the Angle icon. Use your Move tool (v) to adjust positioning of the headline so it sits comfortably in the space at the top left, but doesn’t creep too close to the guideline in the middle of the layout. Now we’ll use a text box. Select your Type tool again. This time, instead of just clicking once, we’ll click in the top left of the empty area on the right side of the layout, then hold and drag down and to the right to create a text box. 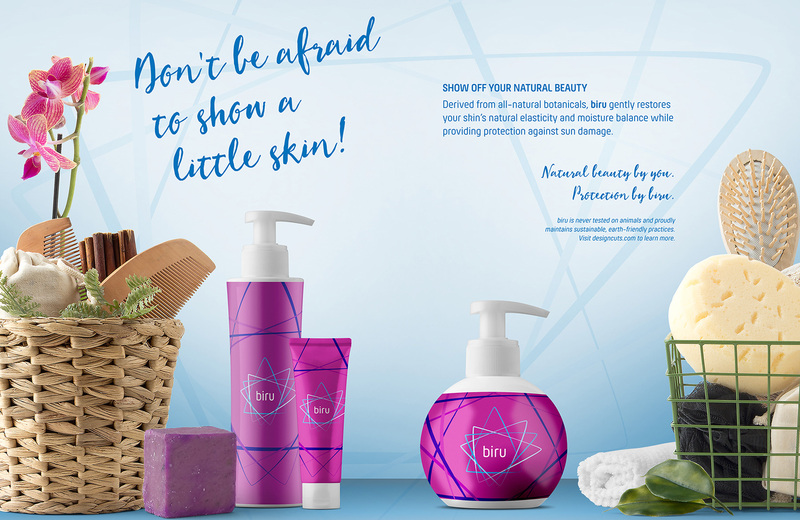 Derived from all-natural botanicals, biru gently restores your skin’s natural elasticity and moisture balance while providing protection against sun damage. 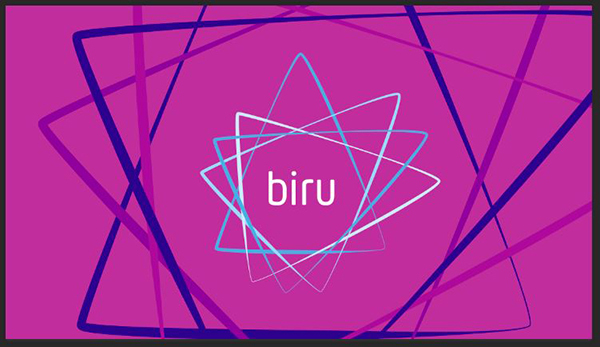 biru is never tested on animals and proudly maintains sustainable, earth-friendly practices. Visit designcuts.com to learn more. Use your Type tool to select the first line. 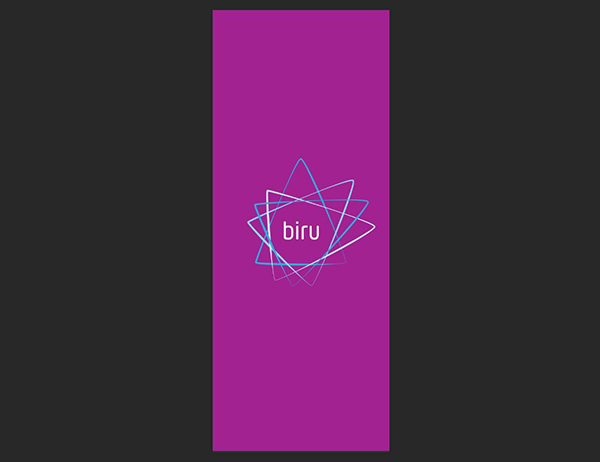 In the Character palette, change the font to the same font you used for the biru logo – in my case, Hansom FY. I’ll use Bold and set the font size to 18 pt since this is a subheadline. Click on the menu icon at the top right of the Character palette. In the flyout menu, choose All Caps. Select the first paragraph after the subheadline. Use the same font as the headline, Hansom FY, but regular weight and without All Caps. 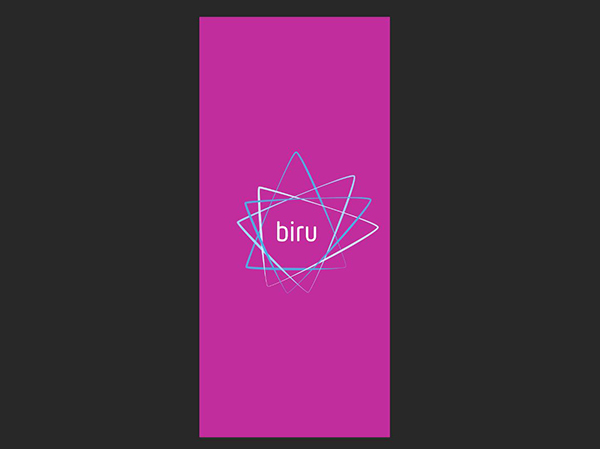 To bring a little more attention to the product name, select biru and change it to Bold. The next two lines are our product tagline, so let’s jazz those up a little by using our handwritten font again. Select the two lines and in the Character palette, change the font to Soulbeams Regular at 30 pt. To balance our text area, let’s right align the rest of our copy. Open the Paragraph palette (Window > Paragraph) and select Right Align Text. For the last paragraph, we’ll make it pretty small. Select the last paragraph using your Type tool. In the Character palette, change the font to Hansom FY Regular at 12 pt. Click the menu icon at the top right of the palette. In the flyout menu, choose Faux Italic. I think we need a little more space between our top paragraph and our product tagline. Use your Type tool to click once after the first paragraph and press enter to add another line break. 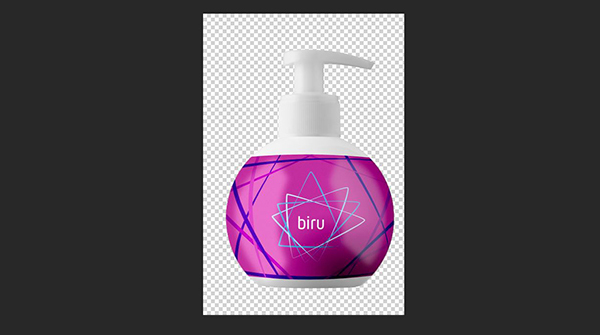 For our final step, let’s go back to our background and tweak it just a little to brighten up the areas around our product bottles. Open the group named Background. 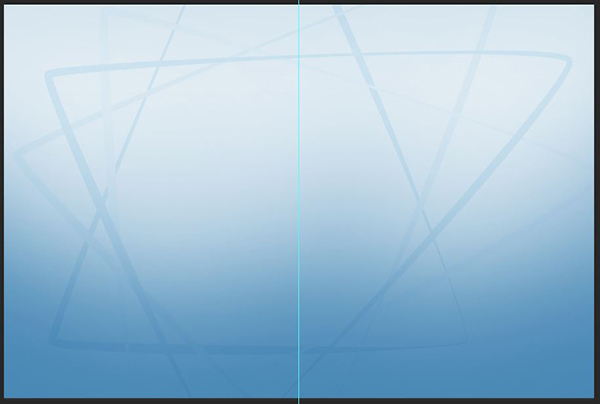 Click on the layer mask thumbnail on the Blue Background layer (the layer mask is the little black and white thumbnail immediately to the left of the layer name). Select your Brush tool. Our brush should still be at 3000 px and 30% Opacity. The fill color should already be set to black. Click on the artboard, one click at a time without dragging, behind the products. This will add little pops of lightness behind each bottle. You may also want to click once or twice behind the smaller copy on the right side of the layout. And we’re done! 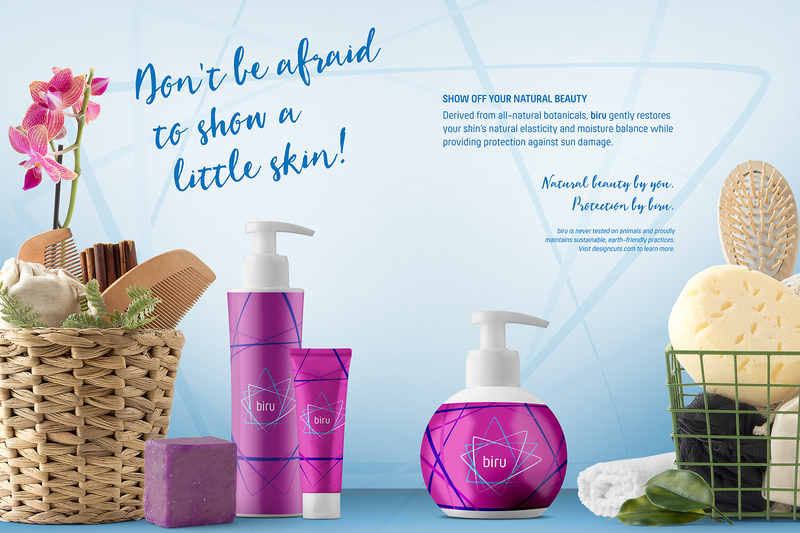 We have a fresh beauty ad that would fool anyone into believing you spent hours working on bottle mock-ups and toiling away in a photo studio. Remember that whether it’s your outcome for this tutorial or something new you’ve made, we’d love to see your designs on our Facebook page. Please leave a comment if you have any questions or suggestions. I always look forward to hearing from you! And there’s still time to check out The Gigantic Mockup Templates Bundle to give your presentations extra oomph for only $29. Thank you for this tutorial. Very easy to follow and I learned a few new Photoshop tricks. You are very welcome, Veronica 🙂 I am so pleased to hear you enjoyed this tutorial and learned some new tricks from it! Thank You DC Guys that you showed this mockup tutorial like never before! So Informative! Enjoyed a lot here! What’s going on? I really would like to do this tut, but example images really help me to make sure that I’m doing it right. But, I am not able to view the images. 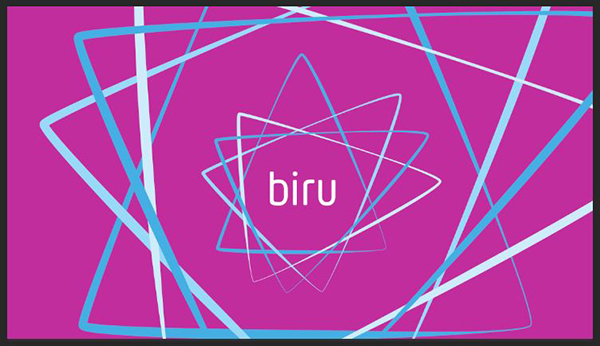 All I am seeing is a rectangle with ‘Biru Beauty Ad’ in it….Please help! Thanks for getting in touch, I am so sorry for this inconvenience with the missing images in this tutorial! Rest assured, this has been amended now and you should be good to go 🙂 please do let me know if you are having any problems seeing them and I will happily investigate this further. Thanks for getting in touch and letting us know about this – I am so sorry for any inconveniece cause! We’ve investigated this on our side and amended this now. Everything appears to be working correctly now but please do let me know if you are seeing any different and I will happily investigate this further for you! Thanks for your kind words, Ian! I hope you enjoy this tutorial and if there is ever anything I could assist you with please do get in touch. I’m always happy to help! I can’t see the images of the tutorials. 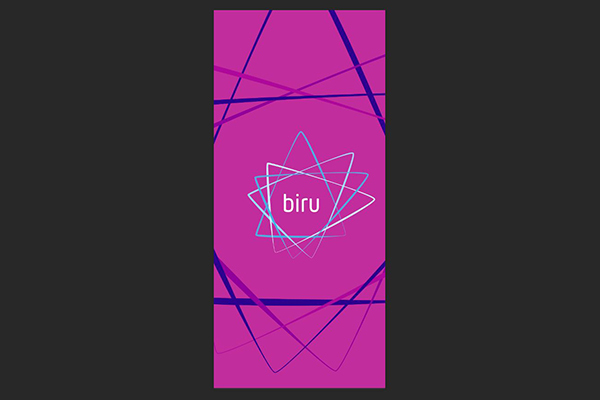 Instead of the image there is a gray rectangle that says “biru beauty ad”. Apologies again for this inconveniece, Chiara! If there is ever anything else I could assist you with please do get in touch. I’m always happy to help! I hope this helps, Su, and I hope you enjoy this tutorial! Please don’t hesitate to contact me should you have any other questions. I’m here to help! You guys are so good that even when I think there is nothing in a tutorial and it would not be my cup of tea it is still AMAZING!